A Daily Walk . 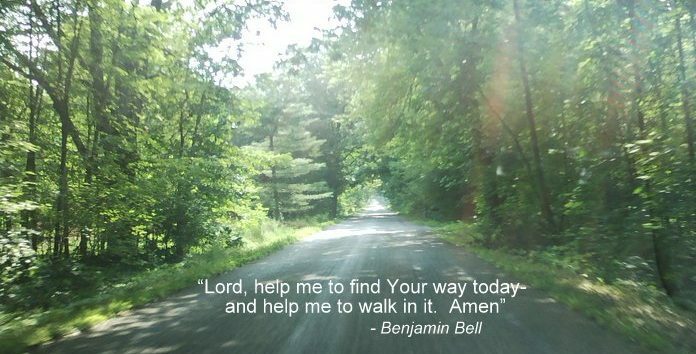 . .
Our walk with God is a daily walk. . . It’s a good way! It’s the only way to be truly happy and completely satisfied! Getting saved is just the beginning of our walk. It is one step through the gate of salvation that puts us on the road to heaven! Once we have made our choice, it is a daily walk with God as He leads the way! I want to share some of the lessons God gives me on my walk with Him! One thing I have learned for sure is that you never learn all there is to know. It is a constant walk, much like a physical walk. Sometimes we are on a nice, straight, smooth path and sometimes the way is rough, winding, and uphill all the way. But wherever God leads us He will be with us and we can always know that it will be for our good. He will supply everything we need along the way. He is our wonderful Shepherd and Guide! We can trust Him as our Guide! I have made my choice forever! I will walk with God!